Gary and I lived and worked in Seoul, South Korea for one year. During our week summer vacation in August, we decided to travel to the South Korean province of Jeju-do. Jeju is a subtropical island located off the southern coast of the Korean peninsula. 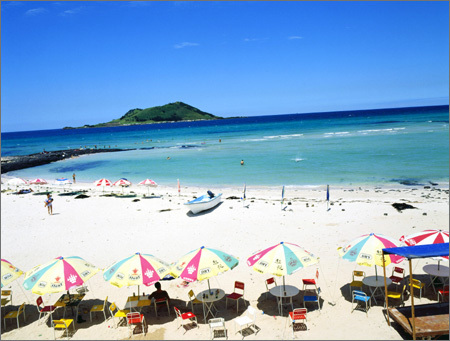 Koreans call it the ‘Hawaii’ of South Korea because it’s a volcanic island and has some beaches. They also call it the ‘Mediterranean’, ‘Bali’ and ‘Disneyland’ of South Korea. To make these comparisons would be slightly true as the island has cactus plants, orange orchards, circus shows, casinos, golf courses, scuba diving and more. It’s also Korea’s holiday and honeymoon island. We visited Hyeopjae Beach (another is Hamdeok Beach), one of the best beaches on Jeju – located next to Halim Park in the southern part of Jeju Island. The sand is quite white and the deep blue and emerald waters are shallow, calm and suitable for swimming. Shower facilities, private lodging, restaurants and a campground, are located right on Hyeopjae for convenience. In the summertime (when the sun is shining), waters are crystal clear and there’s a view of Biyangdo Island in the distance. For beach weather, the best times to visit the island are July and August. The rest of the year is a little too chilly to swim. However, watch out for the occasional torrential downpours during these hot and humid summer months! Directions to Hyeopjae Beach: We flew Asiana Airlines (an excellent airline, would highly recommend) from Gimpo Airport. Then from Jeju International Airport → Take bus no. 100 or 200 from the airport (2,000 won) and go to Jeju Cross-Country Bus Terminal → Take a cross-country bus to Seohoeseon Ilju Road (passes every 20 minutes) → Get off at Hallim Park (45 minutes) and you will find Hyeopjae Beach directly adjacent. In the adjacent Halim Park, you will find Hyeopjae and Ssangyon Caves. Ssangyon (means ‘double dragon’) and is the only two-dimensional cave in the world – a cave that has another cave inside. Another activity to do on the island is to visit Manjanggul – one of the longest lava tubes in the world. Manjang is situated at Donggimnyeong-ri, 30 km east of Jeju City. You can also hike Mt. Hallasan (UNESCO World Heritage Site), a shield volcano and the tallest mountain in South Korea. And, visit the beautiful Cheonjiyeon Waterfall, see here.